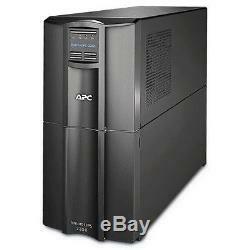 APC Smart-UPS 2200VA LCD 230V. APC Smart-UPS LCD 2200VA 1980W 230V. Interface Port(s): DB-9 RS-232 SmartSlot USB. Input Connections: IEC-320 C20 Schuko CEE 7 / EU1-16P British BS1363A. Output Connections: (8) IEC 320 C13 (1) IEC 320 C19 (2) IEC Jumpers. Maintenance-free sealed Lead-Acid battery with suspended electrolyte : leakproof. Intuitive LCD interface: Provides clear and accurate information in multiple languages with the ability to configure the UPS locally with easy to use navigation keys. Predictive replace battery date: Dynamically provides the month and year when battery replacement is recommended to aide in long term maintenance planning. InfraStruXure Central compatible: Enables centralized management via APC InfraStruXure Central. Three years repair or replace (excluding battery) and 2 year for battery Audible Alarm. Alarm when on battery : distinctive low battery alarm : configurable delays Barcode. Maintenance-free sealed Lead-Acid battery with suspended electrolyte : leakproof Case Colour. Multi-function LCD status and control console Crest Factor. Intelligent and efficient network power protection from entry level to scaleable runtime. Ideal for servers point-of-sale routers switches hubs and other network devices. Smart-UPS feature a 16-segment LED display extended range automatic voltage regulation (AVR) and pure sine wave output on battery. Additional manageability options are available through the Smart-Slot interface which is an internal slot for the installation of optional accessory cards. Full time multi-pole noise filtering : 0.3% IEEE surge let-through : zero clamping response time : meets UL 1449 Form Factor. 43.5 cm In The Box. APC Smart-UPS 2200VA CD with software Documentation CD Smart UPS signalling RS-232 cable USB cable Input Connection type. IEC-320 C20 Schuko CEE 7 / EU1-16P British BS1363A Input Voltage Range. 160 to 286 V AC Interface Port. DB-9 RS-232 Smart-Slot USB Marketing. APC award-winning Smart-UPS is the most popular UPS in the world for servers storage and networks. Trusted to protect critical data and equipment from power problems by supplying clean and reliable network-grade power. In addition to legendary reliability and manageability Smart-UPS have extremely high efficiency at low medium and high load levels making them ideal for todays multi-core or virtualized servers that have varying load consumption. Available in a variety of form factors (tower rack mount rack/tower convertible) there is a model for every application and budget. Rack mounted Smart-UPS are ideal for powering Blade or density optimized servers in a distributed power protection environment as the primary or redundant protection. Smart-UPS models have long been considered the benchmark for all network and server UPS's. 2.2 kVA Noise Level. 0 to 95 % Operating Temperature. 0 to 40 °C Output Capacity. 2.2 kVA Output Connections. (8) IEC 320 C13 (1) IEC 320 C19 (2) IEC Jumpers Output Distortion. Less than 5 % Output Voltage. 230 V AC Output Wattage (Maximum). 1.98 kW Product Family. Regulatory Approvals: C-tick CE EN 50091-1 EN 50091-2 VDE Environmental Compliance: RoHS 7b Exemption China RoHS REACH: Contains No SVHCs Surge Energy. 365 Joules Typical backup at full load. 7 minutes Typical backup time at half load. 24 minutes Typical Recharge Time. Three years repair or replace (excluding battery) and 2 year for battery. Hitari Trade Limited is an online retailer of Gaming Consoles, Games, Accessories, PC Components, Consumer Electronics, Housewares, Kitchen & Home appliances, Gadgets, Toys and other products that we keep introducing on a daily basis. We sell mainly to UK and Europe and currently expanding to cover other non-European countries such as Australia, USA and Canada. We offer the largest Nintendo Wii, Xbox 360 and PlayStation 3 bundles and also able to cater for special orders if you are unable to find what you would like from all our available bundles and packages. We are a fully registered limited company in the UK and Ireland. Company Registration No: 715099 VAT No: GB 989 6830 38. By Credit or Debit Cards. To avoid any further delay in dispatching your order, you must request an "Uncrossed" Postal Order from the Post Office. To guarantee receipt you should return the item by a signed for service; this will provide you with a proof of receipt. Enquiries by post should be sent to: Hitari Trade Limited Unit 13 Magreal Industrial Estate Freeth Street Birmingham West Midlands B16 0QZ United Kingdom. The item "APC Smart-UPS 2200VA LCD 230V" is in sale since Thursday, June 09, 2016. This item is in the category "Computers/Tablets & Networking\Power Protection, Distribution\Uninterruptible Power Supplies". The seller is "hitaritrade" and is located in Birmingham. This item can be shipped to United Kingdom, to Austria, to Belgium, BG, HR, CY, CZ, DK, FI, to France, to Germany, GR, HU, to Ireland, to Italy, LT, LU, MT, to Netherlands, PL, PT, RO, SK, SI, to Spain, SE, to Australia, to United States, to Canada, to Japan, to China, IL, to Hong Kong, NO, ID, MY, to Mexico, SG, KR, to Switzerland, to Taiwan, TH.